A polite race of telepathic killer aliens, a ten-second world conquest, and one teenage boy collide in this wry, gutsy adventure. A little disappointing, partly because the title just doesn't suit the book. Sounds like a kind of funny version of an alien invasion, right? Wrong. It ends up having a fairly serious tone, with a few lighter touches to keep it from getting too morbid. I don't have a problem with the tone, but the title needed to be changed to suit it. But once I adjusted my expectations, it was decidedly not terrible. It has a definite whiff of summer blockbuster about it. The sort of thing that makes good money at the theater, but quickly vanishes from memory. It's a little heavy handed with all of the parallels between the alien invasion and the unsavory parts of human history. (This is JUST LIKE how American settlers treated Native Americans! Really! I'll tell you again in a dozen pages!) In a YA book, this would probably need to be pointed out, once. The invasion itself is over on the first page of the book, so we don't even really get to enjoy that. It's unsettling, how quickly and easily it happens, but I would have liked to dwell on that Twilight Zone feeling. That's over way too quickly for me. No extended scenes of the main character discovering the full extent of the catastrophe. Most of the action after that point is done on the psychic level. But I've seen psychic powers and warfare done much better, so it really did nothing for me. Maybe somebody who'd read less SFF than me would get more out of it. 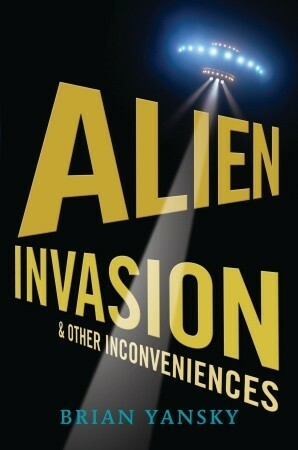 I did enjoy Alien Invasion and Other Inconveniences while I was reading it, but it just wasn't memorable. If Yansky had been able to manage a comic (but not slapstick) version, I might have enjoyed it more. It's not a bad book, I'm just going to forget it very quickly.